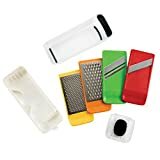 Whatever you're looking to grate or slice, the OXO Good Grips Complete Grate and Slice Set has got you covered. The set includes 4 colour-coded grating and slicing plates: coarse and medium grating plates & straight and julienne slicing plates. 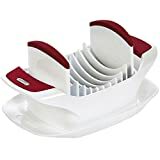 While you can use the plates above a bowl, the non-stick feet on the box mean you can also use that to collect your food, without having to worry about it moving. 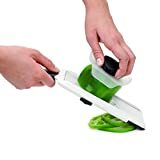 The set also includes a guard which allows you to grate and slice with your fingers a safe distance away from the blades, and when you're finished it all packs away into the box neatly for smart storage. Dishwasher safe, the set embodies OXO's principles of versatility, usability and functionality. Established by Sam Farber on the principal of universal design, versatility is in the OXO name, literally - the name was chosen because it reads the same regardless of whether it is written horizontally, vertically, upside down or backwards! 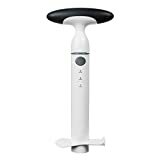 OXO aims to question the status quo, designing products which make everyday tasks that little bit easier, irrespective of age, gender, or whether you're right or left handed. Today OXO offers over 1000 products which have a tangible impact on the ease of everyday life. 25 x 10 x 10cm H.
Colours cheese slicers are characterised by their colourfulness, making them ideal for the creative home. All Colours products are made of high-quality Swedish steel, and are available in a range of trendy colours. The Benriner Vegetable Slicer complete with 3 changeable blades for different styles of slicing.The stainless steel blades will give you the perfect slice every time, from thin slices for delicate garnishes to thick vegetable fries.Perfect for using with potatoes, cucumbers, carrots, apples and onions.Complete with a slicing guard to firmly hold the product in place and protect your fingers this slicer is easy to use and clean. A kitchen-drawer must-have! Quickly prepares runner beans for cooking - just pull them through the blades to creates neat, evenly sized slices. 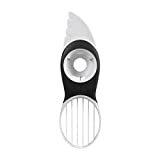 Stainless steel blades, with an extra wide mouth for ease of use. 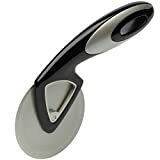 KitchenCraft Biter Bagel Slicer, Plastic/Synthetic Material White, 9.25" x 7" x 3.88"
Slice Your Bagel Safely With Ease! 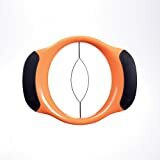 The BAGEL GUILLOTINE is the Fast, Safe and Easy way to slice bagels. Cuts sustained while cutting bagels are one of the major reasons for Emergency Room visits. 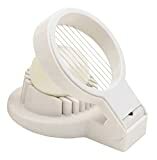 The BAGEL GUILLOTINE has a cradle that holds the bagel while two clear acrylic safety shields keep fingers away from the patented bagel piercing blade. Slicing a bagel is fast (people are known to have sliced as many as 24 bagels in a minute) and easy. Just lift the handle (which includes the blade and safety shields). Place a bagel in the cradle. Place the blade handle unit over the cradle and push down with a rapid motion. Voila! Remove the perfectly sliced bagel. XYLAN coated blade for smooth slicing and durability. The BAGEL GUILLOTINE will slice one-handed and has received the AMERICAN SOCIETY ON AGING-SILVER AWARD. It doesn't get any faster, safer or easier. The Pizza Slicer is 25mm in depth, 110mm in width and 195mm in length. 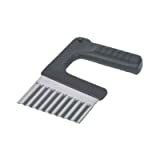 The Dexam Crinkle Cutter is great for preparing crinkle cut potatoes or vegetables. 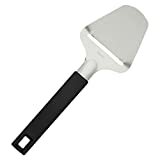 It has a Stainless Steel blade and strong black plastic handle, it is dishwasher safe and the blade is 8cm wide. With 6 grams of the highest quality protein and 14 essential nutrients, eggs provide the energy needed to keep you going. They're the natural choice for an active lifestyle. With this adorable and useful egg slicer, you will get perfect egg slices every time.